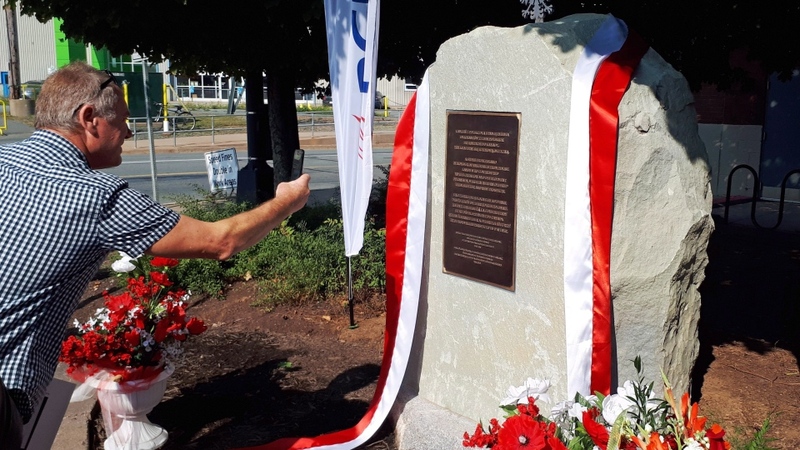 HALIFAX -- A monument erected in Halifax to honour the Polish-Canadian community further cements the bond between the two countries and highlights the centuries of history that forged it, dignitaries said at Sunday's unveiling. "We want to preserve and develop the closest possible bonds with our compatriots all across the world, and this connection -- the Canadian-Polonia -- occupies a very special place," Duda wrote. "I trust that it will be a lasting trace of Polish people's presence in Canada, and inspiration for even better cooperation between our two respective countries." A plaque on the front of the monument reads: "A stone from Poland in honour of emigrants from Polish lands who contributed to the creation and development of Canada, which in return offered them shelter and new prospects." "This is not just an average rock," said Jan Skora, Honorary Consul of the Republic of Poland, who came up with the idea for a monument in 2016. "This is extremely important, emotionally, for Polish people, the people who cannot go anymore to Poland, to touch this rock and be in Poland. This is a special rock." In the mid-1800s, two waves of Poles arrived in Canada, forming the country's first Polish settlements in Ontario. Another wave occurred through the 1890s until the start of First World War, in part because of Prussian and Austrian occupation in their home countries. According to Statistics Canada, around one million Canadians claim full or partial Polish ancestry, with about 10,000 people of a Polish background living in Nova Scotia -- nearly 10 per cent of the province's population. Chris Solarski, who attended Sunday's event with his family, is one of them. "We found the registry and we found their names, and what they came over with: literally $25 in their pocket and one suitcase," said Solarski. While he said the language got lost over the years as his family settled in Canada, he said he tries to maintain Poland's culture and holiday traditions as much as possible with his wife and two children. "It's important to carry on so it keeps going. We're Canadians first, but we still have that Polish heritage and we need to maintain that," he said, adding that he was pleased to see a monument dedicated to families like his. "The people who came over, like my grandfathers and my grandmothers, they were the building blocks of the country and it's important to recognize their contributions."